Following a national trend, voter registration continues to soar in Connecticut, especially among young people, who traditionally have weak participation in elections. According to data from the Connecticut Secretary of State’s office, from the 2016 election through the end of September, 103,436 new voters registered as Democrats, compared to 53,371 who registered as Republicans. But many more Connecticut residents — 168,090 –registered as unaffiliated voters. 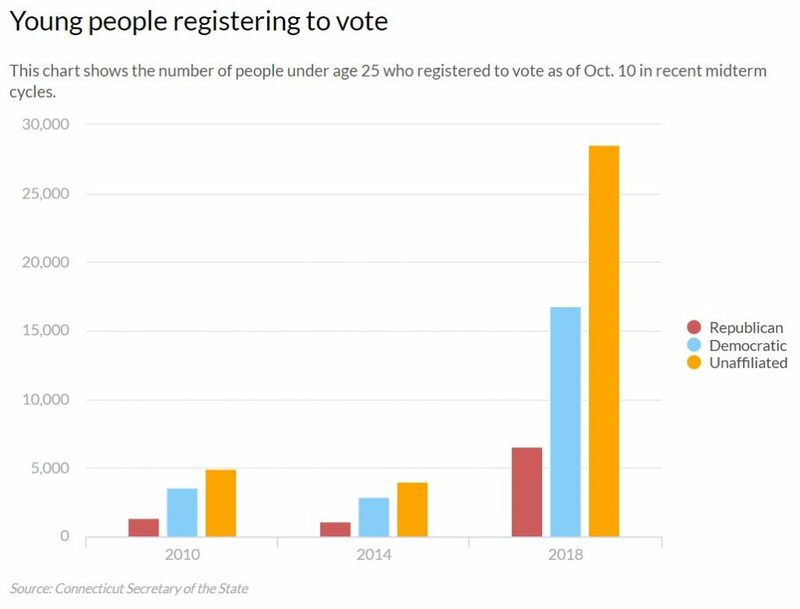 Although voter registration in Connecticut has surged for all age groups, the biggest increase is among young voters, aged 18 to 25. In the last midterm cycle, as of Oct. 10, 2012, only 7,960 Connecticut residents in that age bracket had registered to vote. As of Oct.10 of this year, 51,659 young voters had registered. More of those young people registered as Democrats (16,797), than Republicans, (6,596). But more than half –28,566 — of those new young voters registered as unaffiliated. The increase in voter registration across the board is significant, as well. Since there’s no presidential contest in a midterm election, the number of those signing up to vote in those cycles is usually depressed. That trend has been broken in Connecticut and elsewhere across the nation. 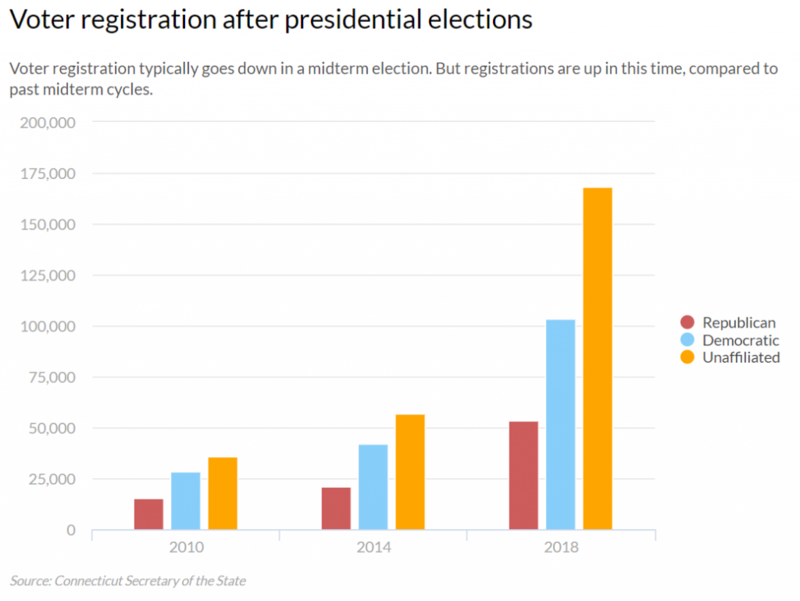 Compared to the same time period in the last mid-term election, new Democratic and Republican voter registrations in Connecticut more than doubled and unaffiliated voter registration have tripled. “Just in September, we had more than 20,000 registrations,” Merrill said. Voter registration in Connecticut ends on Oct. 30 and enrollment usually surges as that deadline draws near. This year is no different, with the pace of registrations accelerating even more since the beginning of the month. More than 5,600 new voter registration were processed in the first 10 days of the month, as the controversy over the confirmation of new Supreme Court Justice Brett Kavanaugh transfixed the nation and deepened its partisan divide. In those 10 days, 2,312 voters registered as Democrats, 1,202 registered as Republicans and 2,153 as unaffiliated. Merrill attributed the increase of voter registrations on several factors. One is that Connecticut residents can now sign up to vote when they are at the Department of Motor vehicles and online. An increase in social media campaigns aimed at registering voters is also helping increase registrations, Merrill said, as is increased politicization of the nation since President Donald Trump won the White House. “The 2016 election seems to have galvanized voters,” Merrill said. Connecticut is one of 19 states where Democrats are ahead of Republicans when it comes to active registered voters. As of Oct. 10, there were 780,313 active Democratic voters registered in Connecticut, compared to 457,813 active registered Republicans. The number of unaffiliated active voters, who usually split their votes between party candidates fairly evenly, was 862,466. Although registered Democrats in Connecticut outnumber registered Republicans, Democrats in the state turn out to vote “at a slightly lower percentage” than GOP voters, Merrill said. The Connecticut Secretary of State defines active voters as those who have voted in the last two federal elections. However, Connecticut residents are not removed from voting rolls until they are on the inactive list for four years, so many “inactive” voters can vote on Nov. 6. “We’re breaking every record,” Brooks said. He said 6,122 people in Connecticut signed up to vote through Vote.org this year — 2,718 in October alone. Vote.org helps residents in states that allow online registration by providing them with forms and instructions, and those in states that don’t allow online voting by providing them a PDF of a registration form they can fill in and mail to their registrars of voters. In some states, the organization faxes completed forms to registrars. Raven attributes the new interest in registering to vote this year to increased activity by voter registration groups – and to celebrities like Taylor Swift who have taken to social media to boost enrollment, especially among younger voters. Swift’s Instagram post on Sunday urged her 112 million followers to register to vote on Vote.org and catapulted the generally apolitical singer into the fray of November’s midterms by endorsing two Tennessee Democrats. Raven said his group registered 364,000 new voters, mostly 18 to 25 years old, within two days of that Instagram post. About 15% of the new voters in Norwalk this year are under 21 years old. Overall, voter registration in Norwalk now exceeds 52,000 and is still climbing. In the past, voter registration tended to decline slightly after a Presidential election. As people moved out, their names got removed from the voting list, but the people who moved into Norwalk often did not register until the next Presidential election season. In 2016 registration surged from a normal Presidential election year total of 45,000 voters up to 48,000+ and those increases have continued into this mid-term year. The ratio of Democrats to Republicans in Norwalk is slightly greater then the state-wide 2 to 1 ratio — Just short of 20,000 Democrats vs. 9,500 Republicans. There are about 10% more Unaffiliated voters than Democratic voters in Norwalk, which is about the same percentage as statewide. Unfortunately I do not have access to the official voter database at home, so I cannot give the exact numbers in this post. 22,000 swing votes are quite a lot. I hope they’re all watching what’s going on. Hopefully we will establish a more informed voter base than in the past. Not sure how relevant Democrat versus Republican is for these new young voters. They have been disenfranchised of a future, unable to afford their own homes, taxed at ever-increasing levels, states and cities laden with debt and unfunded pension liabilities. In Europe the business model now for young people is to live at home, start families much much later once/if a job is found, then await parental death before inheriting the house. The trouble here is US property taxes are so high that every 20-40 years you must pay back your house to the local city in taxes. Hopefully the youngsters vote for better management of their cities and state. CT is now the most indebted (per capita), incompetently administered state in the USA. I think most people vote their party and our blind to everything else, which is very sad. I always vote for what I think is best for our country and the average working US citizen based on what I hear from the candidates. I do my best to become informed before I vote and cast my vote based on information not party affiliation. I always give the benefit of the doubt to the winner regardless of if I voted for that person or not and respect the office of the presidency. I think our country is a disgrace based on what has gone on over the past two years with circus of politicians and political leaders. I must admit I have lost faith in the political system and career politicians in general. I am embarrassed as a US citizen and hope someday the US will become united rather than divided. Trump could cure cancer and they would find fault with it protesting that he took away our right to have cancer. Correction to above: our was meant to be are. I think most people vote their party and are blind to everything else, which is very sad. For all the critics out there.